Today’s complex business world requires everyone at thinkdm2 to summon their intelligence, passion and talents to create simple, smart ideas for every assignment—from standard projects to year-long integrated programs. We are thinkdm2. The biggest companies in the world have entrusted us, time and again, with their most precious assets. Their brand. Their reputation. Their essence. For over twenty years we have regarded that trust as proof of our ability to have a positive impact on their business. We love what we do. We did not get into this business for the paycheck. We do it for the beauty of a letterform. For the well-crafted headline. For the late nights and internal fights that give birth to original ideas. For the art and science of operationalizing a brand and empowering a company to rise above its competitors and sustain that lead. In fact, our principals are Certified Brand Strategists dedicating their efforts to the advancement of true brand development. We are thinkdm2. We love what we do. 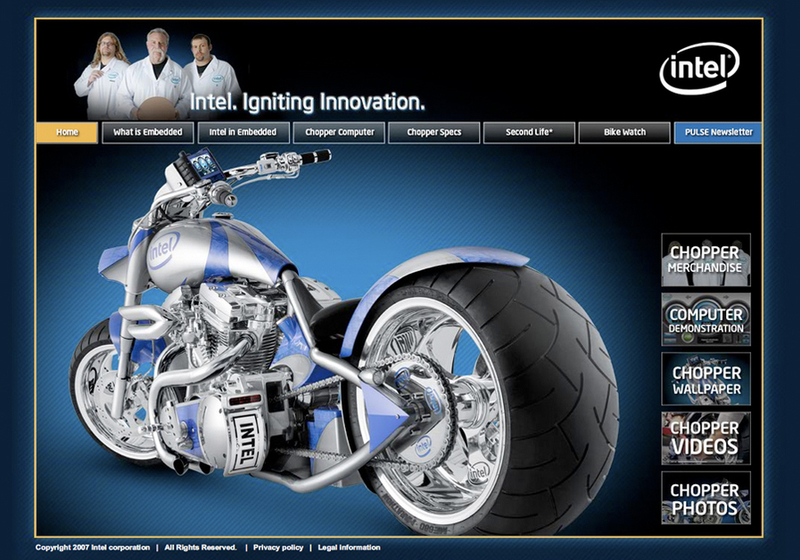 This screenshot is the product of a customized branding campaign we delivered for Intel Corporation. This is a perfect example of how we blend the latest internet viral opportunities with our customer's custom branding needs. Thinkdm2. Trusted by the biggest brands in the world.